When searching the U.S. Code in HeinOnline, it is best to refine your search by adding the Title Number you want to search across. To begin searching, find the Advanced Search option at the top of the main page of the U.S. Code database. 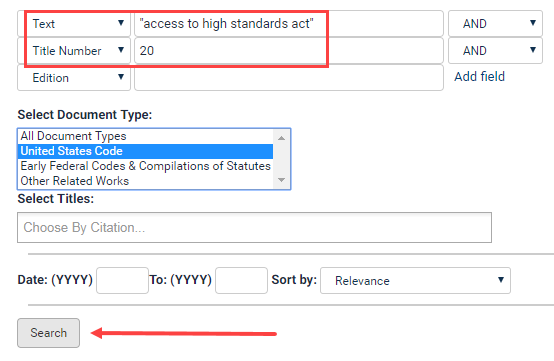 Example: Search for “Access to High Standards Act” across title number 20. You can also search using the Full Text tab at the top of the main page. From here you would type text:”access to high standards act” AND title_num:20 and hit the search button.